One of our favorite adopters of all time adopted Onyx today! A while back they adopted two very senior kitties, Lucinda and Georgina, who ended up only having a few months left to live. When they died it was devastating for all who loved those special kitties, and their family took the loss very hard. We hoped that some day they would be able to open their hearts and home to another cat, and today turned out to be that day. 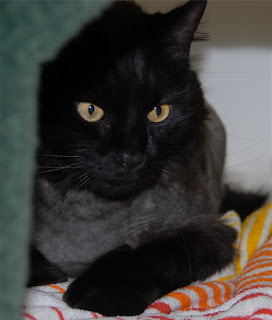 We are thrilled for Onyx and think he is a very lucky cat. We can't wait to see what he looks like once his coat grows back (it had to be shaved because he came to us so terribly matted). His new mom already thinks he is beautiful.